Welcome to Messina, the third largest island on the island of Sicily. Founded by Greek colonists in the 8th century BCE, this lovely city has been through it all. Conquests, earthquakes, tsunamis, even the Black Plague didn't stop these people. With each event, they rebuilt and restored their city and there are many wonderful examples of architectures merging to create quite a picturesque city. Messina is located on hilly land that overlooks the port and is close enough to see the Italian mainland. Much of the population speak Greek, but bilingual guides are always available through excursions to help your visit be more pleasant. We offer the absolute best options for your tours and cruise shore excursions in Messina! Roundtrip private transportation from your Messina Cruise pier! Sightseeing of Giarre and Zafferana! 1-hour stop at Mount Etna - Silvestri Crater! Visit the Greek Theatre and Palazzo Corvaja! Escape the cruise ship shore excursion crowds and enjoy unique sights of Sicily and surrounding area! Enjoy your private driver and guide on this memorable excursion. 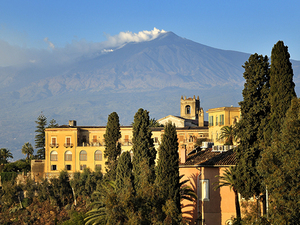 Admire one of the most amazing and still active volcanoes in the world, Mount Etna! Bring your camera, since you will visit the Silvestri Crater and the outstanding views. Then you will discover Taormina, a very picturesque town very well known for its resorts and unspoiled beauty. Round trip transportation from near your Messina cruise terminal with on / off privileges! The multi-lingual audio narration on the bus - available in 6 languages! Stops at the must-see sites with 2 routes and 15+ set stops to hop on and off where you want! Option to do both routes or just one! 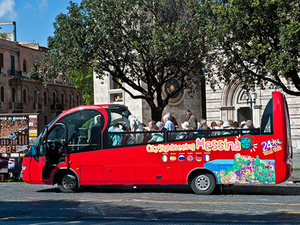 Spend your day exploring Messina on this City Sightseeing Hop On Hop Off Bus. See the best sites and hop off at the ones you want to explore or just stay on board for the full circuit! A place of art and culture, the city has given birth to one of the most popular Italian painters, Giovanni Antonio of Antonio. Roundtrip shuttle transportation from a central meeting point close to your Messina cruise port to Taormina! Assistance on board the bus in English and Italian! 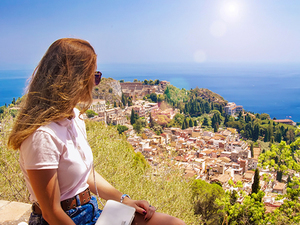 Free time to explore Taormina on your own! BONUS - one complete lap of the City Sightseeing Blue Route in Messina! Enjoy a picturesque ride along the coast where all you need to do is revel in the beauty. Luxury round-trip shuttle from Messina to Taormina provides this fabulous opportunity to enjoy nature, history, and culture at its best, all in a single day. 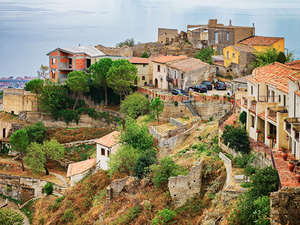 Explore Taormina on your own, at your own pace. Don't miss this opportunity to see Sicily in this stress-free, relaxed adventure! Roundtrip shuttle transportation to Taormina and Castelmola from a central meeting point outside your Messina cruise port! 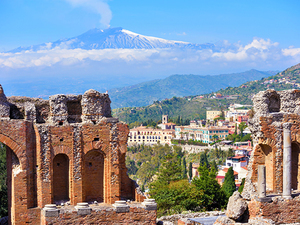 Free time to explore Taormina and Castelmola on your own! Enjoy a relaxing drive along the coast, picturesque peaks, and with enough history and culture to fill your day. This Messina Shuttle to Taormina and Castelmola Excursion was made for you! Spend a relaxing day enjoying the sights, sounds, and tastes of Sicily without the hassle of traffic and crowds. A safe and reliable yet super affordable way to see the best at your pace. Visit Savoca and Forza d'Agro - villages featured The Godfather II movie! Free time at both towns! Enjoy the magnificent beauty of Savoca and Forza d'Agro, two villages that were used as locations for the famous movie, The Godfather. A private fun-filled Messina Excursion where you will create some amazing memories! Roundtrip shuttle transportation from a central meeting point close to your Messina cruise port! 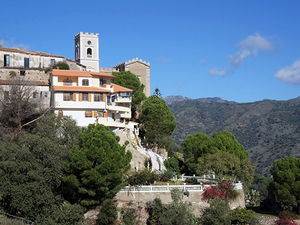 Free time to explore Taormina, Castelmola, and Savoca on your own! This excursion gives you the opportunity to explore three stunning coastal villages: Taormina, Castelmola, and Savoca; charming and historic all in one adventure. Three amazing panoramic vistas make this a very memorable excursion! Save and reliable transportation is provided, you do the exploring!